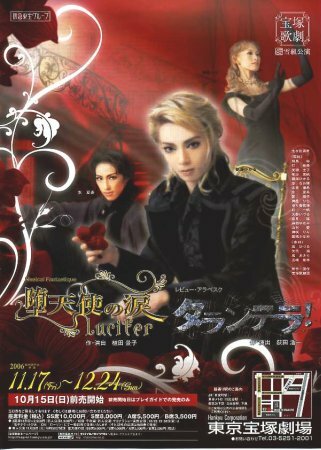 English Title: Lucifer's Tears / Tarantella! Romanized Title: Datenshi no Namida / Tarantera! Paris reaches a cultural maturity that reeks of decadence and immorality in the early twentieth century. One evening, opening night at the Musard, a club famous for its costume balls, features Lucifer in Hell. An eerie forest of Hell provides a backdrop for the lead dancer. He icily and violently dances, representing the demonic magic of the fallen angel Lucifer, who appeared before Adam and Eve in the disguise of a snake to tempt them away from God thus and seek his own revenge against God. The audience spellbound by the unreal dance, lavishly praises the performer. Shortly afterward, the dancer returns to the stage, and upon recognizing the up-and-coming choreographer Jean-Paul, says to him: "My name is Lucifer. I have come from Hell to see you". Jean-Paul realizes that he alone can hear Lucifer's voice. He invites the astonished Jean-Paul to pay a visit at his mansion and then suddenly disappears. A few days later, Jean-Paul learns that production of a play based on Charles Baudelaire's Les Fleurs du Mal has been discontinued, due to its immoral content. Duke and Duchess Leblanc arrive and find Jean-Paul raged by the decision: He had been choreographing the piece. Duchess Justine Leblanc, who is Jean-Paul's mother, and her husband, stepfather to Jean-Paul, have wielded their influence to abandon the project. Justine does not appreciate her son's work, condemning it as a disgrace to the art of dance. Justine and her son hate, and hurt, each other. Sinking in depression, Jean-Paul remembers Lucifer's invitation. At dusk on the following day, Jean-Paul visits Lucifer's mansion. His host leads him into a garden filled with blooming roses blooming "blue" roses. Lucifer asks the choreographer to create a work to be titled A Dance in Hell. He is sure that his magical dancing skills will fascinate people and thereby make them revere him. He also reveals that he will use A Dance in Hell as blasphemy and, therefore, as revenge against God. Jean-Paul cannot resist Lucifer's magnetism. The production of A Dance in Hell begins. Lucifer has the privilege of choosing the heroine from among dancers. He selects Yvette, a favorite of Count Dunois (a patron of Jean-Paul), and appoints her to the role of heroine. Sebastian, a pianist and her boyfriend, objects to Yvette taking advantage of the Count's favoritism. However, Lucifer seduces her into taking the role by convincing her that she will never have such an opportunity again. Jean-Paul dislikes the musical compositions of Edmond, who is suffering from a creative slump, and impatiently demands that the composer start over from scratch. Before Edmond can finish, Jean-Paul learns that Edmond's pupil Marcel has remarkable talent, therefore asking Marcel to compose the pieces of music. Jean-Paul then suggests that Edmond announce that the pieces are his own compositions. Edmond wavers in his decision to plagiarize his pupil's work, as he finds dishonesty contemptible. Lucifer approaches Edmond and fans his jealousy for Marcel's talent, thus inflaming his evil spirit. Edmond and Yvette begin obtaining what they desire by obeying Satan instead of God. Lucifer says that this human world filled with ugly desires is the image of A Dance in Hell, sneering at the real human nature loved by God. Lucifer, who was thrown out of Heaven by God, eternally lives in darkness, suffering from profound loneliness. He strolls through Paris and comes to a small church in a popular quarter. A blind prostitute, who has fallen nearby, is brought into the church. Lucifer notices that she has been cutting herself, and asks her why she has attempted suicide. He learns that she was named Lilith after the female devil, and sympathizes with her in her loneliness, which he realizes is similar to the darkness in his own heart. Lucifer captivates and manipulates important persons of society one after another. People reverse themselves about their critical views they have had toward Jean-Paul's works. Jean-Paul questions Lucifer about his true purpose in making A Dance in Hell. Lucifer answers that he wants to discover why God created human beings. Jean-Paul tells Lucifer that human beings are predestined that they often shall become devils instead of themselves and that their innocent souls shall become dirty. Then, he talks of his twin sister from whom he has been separated. Lucifer identifies Lilith, whom he saw at the church, as Jean-Paul's twin sister who had been praised as a ballerina only angels dancing in Heaven can match. Lucifer rushes to the church to see her. Lilith lost her prestigious position and will likely die in a few days. Lucifer asks her if she bears a grudge against God who gave her nothing but suffering. She replies that she wants to believe that God loves even a woman like her and that she accepts God's wishes whatsoever. Lucifer wonders if people live only for the sake of suffering. In the end, he discovers the true nature of human beings, in the course of his contacts with individuals, who struggle to live on while longing for salvation. The introduction aims at enlivening the revue to begin. Tarantella comes on to the stage and dances. Other performers join him and move around. Tarantella in a guise of matador appears in the midst of a Spanish scene. At River La Plata, Tarantella meets with a butterfly. He falls in love with her but later leaves her. The lyric scene in Buenos Aires changes into the one in Amsterdam filled with the sound of accordion. Tarantella dances in duet enjoying the vastness of the ocean. A lively and Latin jungle revue unfolds with samba numbers. A duet dance changes into a mass dance. Final show for Top comby Asami Hikaru and Maikaze Rira. Other graduating seito: Kou Hizuru (Senka), Arisa Miho, Yuu Naoki, Ai Youko, Hanao Konomi, Aya Mizuki, Yumeka Ayari, and Murasaki Itsumi. For Tarantella, Yashiro Kou joins the cast. Takarazuka Precious: Sakakihara Kazuko's Takarazuka First Night & Event Revue article - Tarantella! Created by DarkCyradis. Last Modification: Sunday 22 of November, 2015 05:49:10 PST by tallae.